Parent–child interactions significantly influence children’s development. Focusing on parenting practices is therefore a crucial means to disrupt trajectories characterised by risk or disadvantage. 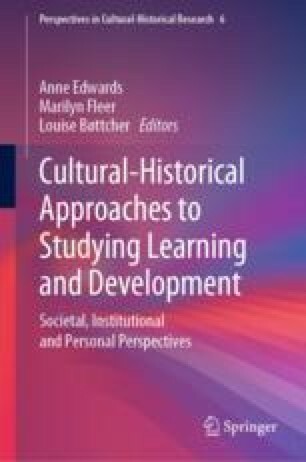 Hedegaard’s approach to understanding children’s development looks at the interplay between society, institution and person, foregrounding motives and demands in practice. Her associated valuable set of analytical resources can be used to go beyond previous cultural-historical accounts of expertise in partnership-based early intervention services. This chapter proposes the notion of partnership as a productive entanglement between institutional practices of the family and those of early intervention. Such entanglement is constituted in an emergent and expansive pedagogic practices of noticing, attaching significance and attributing agency. This offers a new way to conceptualise relational work between professions and families. This study was funded by the Australian Research Council, project number DE150100365. Thanks are given to staff and clients from Karitane, Tresillian and Northern Sydney Local Health District for their support. Teena Clerke and Anne Nguyen contributed to initial analyses of the practice discussed here. Edwards, A. (2007). Working collaboratively to build resilience: a CHAT approach. Social Policy & Society, 6(2), 255–264. doi: https://doi.org/10.1017/S1474746406003514. France, A., & Utting, D. (2005). The paradigm of ‘risk- and protection-focused prevention’ and its impact on services for children and families. Children and Society, 19(2), 77–90. https://doi.org/10.1002/chi.870. Hopwood, N., Clerke, T., & Nguyen, A. (2018). A pedagogical framework for facilitating parents’ learning in nurseparent partnership. Nursing Inquiry, 25(2), e12220. doi: https://doi.org/10.1111/nin.12220. Kelly, Y., Sacker, A., Del Bono, E., Francesconi, M., & Marmot, M. (2011). What role for the home learning environment and parenting in reducing the socioeconomic gradient in child development? Findings from the Millennium Cohort Study. Archives of Disease in Childhood, 96(9), 832–837. doi: https://doi.org/10.1136/adc.2010.195917. van Houte, S., Bradt, L., Vandenbroeck, M., & Bouverne-De Bie, M. (2015). Professionals’ understanding of partnership with parents in the context of family support programmes. Child & Family Social Work, 20(1), 116–124. https://doi.org/10.1111/cfs.12067.